The 2018 National Defense Strategy directs the Department of Defense to transform into a flexible, agile force capable of operating in a complex world characterized by “competition below the threshold of armed conflict.” This document and the subordinate National Military Strategy and Joint Strategic Campaign Plan direct the Department’s planning enterprise to develop long-term, open-ended, global competitive campaigns against a set of specific and enduring geopolitical threats. Unfortunately, in absence of guidance as to how this competition should be accomplished, the resulting campaign plans are reactive and oriented upon preparation for regional military conflict. Furthermore, these plans were developed using a doctrine and methodology built for planning operations, a process poorly suited to address complex, trans-regional, unending strategic challenges. But the mere initiation of these global plans by the Department is a good first step, and offers unique opportunity to create a viable alternative method to design strategy. Strategic design differs from planning not only in its strategic context, but also in purpose, methodology, and output. Unlike plans, which attempt to script out a sequence of actions, strategic design should aim to comprehensively and continuously understand the problem. Current military planning doctrine was built to transform “national strategic objectives into activities by development of operational products that include planning for the mobilization, deployment, employment, sustainment, redeployment, and demobilization of joint forces.” As a tool to achieve limited and clearly identifiable objectives, the process is exceptional. Also like a tool, the user risks injury when it is misapplied. Planning doctrine was built to achieve operational level objectives limited in flexibility, scope, and duration. It drives planners to attempt to identify operational end states and reverse-engineer a sequence of linear, causal, measurable actions to build a roadmap to operational success. This doctrine is fundamentally constrained by a presumption that military operations can generate predictable, repeatable effects, and that contextual variables can be foreseen and controlled. But in designing strategies for flexible, perpetual, real-time competition, the concept of achievable end-states is a mirage—enchanting, yet largely immeasurable and unattainable. There is no end state in perpetual competition, and therefore any attempt to reverse-engineer a path will prove futile. The defense planning enterprise must realize the inadequacies of current doctrine and adopt a different tool for strategy: strategic design. Strategic design differs from planning not only in its strategic context, but also in purpose, methodology, and output. Unlike plans, which attempt to script out a sequence of actions, strategic design should aim to comprehensively and continuously understand the problem. Such a strategy should remain above the level of operational detail, and instead convey a grand, system-level, conceptual overview. It should provide an orientation to the commander’s understanding and intent, like a compass bearing that points toward desired or acceptable futures. From this understanding, subordinate operations can be devised and executed, via delegation and the principles of mission command. Designers must remain constantly vigilant for emerging opportunities to experiment and capitalize upon promising leads. They must continuously challenge assumptions, remain vigilant to changes in the environment, and be empowered to adapt designs accordingly. Perhaps most importantly, a strategy for a complex problem must remain adaptable to the inevitable changes in the environmental context. Adoption of strategic design will require four significant changes. Foremost, the Department of Defense needs a means by which planners may conscientiously orient between the operational and strategic frames of reference. Dr. David Snowden has developed just such a model, which he calls the “Cynefin Framework” after the Welsh word meaning “place of your multiple belongings.” This framework distinguishes between the complicated (operational) and complex (strategic) problem contexts, and offers guidance on how to approach problems in each. Complicated environments require a sense-analyze-respond approach, like that prescribed in planning doctrine, which allows the planner to select the best course of action to reach a planned terminus based on a fixed set of measurable variables. Complex environments, as in the competitive strategic realm, require a completely different response. Because of the lack of an identifiable end-state, and because the system variables change with every interaction, these sorts of problems instead require application of a probe-sense-respond methodology that seeks to discover and capitalize upon emergent, novel solutions. Once the correct environmental context is identified, planners may then use the corresponding approach to frame recommendations. However, when planners misidentify or remain ignorant of their environmental context, the Cynefin framework predicts they will fall into a state of disorder. Planners in this state tend to grasp for external excuses why the particular plan failed, yet make no attempt to change their approach. Unfortunately, the frustration caused by disorder is all too familiar amongst today’s planning staffs. Adding a preemptive step to planning doctrine that forces identification of one’s contextual environment could alleviate much of this frustration and wasted effort. Second, strategic design teams must be constructed differently than operational planning teams. Unlike secluded military-centric operations planning, the nature of the complex realm necessitates inclusion of other governmental agencies and international partners from the start. Interagency and international partner equities must be included from the start to provide a deeper and broader optic of the environment, allowing designers to better appreciate emergent aspects that otherwise would remain unexplored. This construct also enables design participants to build, test, and strengthen connections and concepts throughout the process. Furthermore, an inclusive design team enables participants to bring the capabilities of their respective organizations to bear. Team composition is key to the strategic design process. The team should be formed around a core nucleus of dedicated individuals. This core must be empowered to build a network of expertise and interest from a wide range of sectors beyond the military community—governmental, economic, commercial, legal, international, etc. Because they must communicate continuously, the primary task of the core members would be to facilitate discussion and an open exchange of relevant information and ideas between the networks of other team members as they work to develop the strategy products described below. Once interesting and plausible operational ideas surface, the core team would then be responsible for coordinating with those assigned to resourcing, controlling, and executing the initiatives. Most importantly, the team must have a timely and appropriate feedback mechanism to judge the effects of the strategy so that they can look for subsequent investment opportunities. Third, designers must adopt a new language that better conveys the characteristics of strategic design. Operational terms like end state, measures of performance, assessment, and lines of effort have no meaning in the complex realm. Just as hockey lexicon is poorly suited to call a baseball game, designers should adopt a different language to help planners mentally shift to the complex realm. The language of investment banking makes for an excellent candidate for adoption. When discussing competition strategies, designers could employ terms such as diversification to convey a range of options intended to generate many incremental gains; return on investment to judge the effect a particular action; analysis to describe the effort to understand past system trends; prospectus as a means to convey a summary and prediction of those system trends; and divestiture to convey the need to abandon a particular effort. This investment-framed methodology also inspires innovation, and mitigates large-scale risk by accepting failure as not just possible but inevitable. It promotes the employment of control measures to minimize risk by allowing invalid approaches to fail in a safe and controlled manner, so they may then be abandoned at minimal cost. Adopting the language of investment also helps military planners better communicate with non-military stakeholders, and better conveys the perpetual, emergent nature of the complex competitive realm. Finally, new Defense guidance is required to account for the different methods and desired outputs of strategic design. While operational design orients toward a single course of action, strategic design should aim to test a variety of simultaneous, controlled experiments to determine viability. Designers must be allowed to study, experiment, and iterate indefinitely, as the problem sets they face are likewise continuous and unending. Most importantly, initiatives must be allowed to fail, safely and early, as new innovative solutions will emerge only through experimentation. Timely determination of failure, however, requires a deep understanding of the underlying systems. Therefore, strategic designers must remain a step removed from operational planning, and instead focus their efforts on developing a comprehensive, team-based understanding of the systems of the strategic environment. This systemic understanding can then better guide the strategic design process, and subsequently identify operational opportunities to invest or divest resources through subordinate activities. With this new guidance must come an understanding that the products of a complex-realm strategy design effort will look vastly different from those characteristic of operational planning. There will be no force deployment synchronization matrix, no quantifiable progress objectives, and no subordinate taskings. There will be no phasing discussion, lines of effort, or end states. Such a strategy should also be brief, with illustrations and diagrams as welcome inclusions, and could even be presented as a compelling narrative. The resulting strategy should explain the system of concern, the rules of that system, inherent relationships, an outline of the overall strategic approach, an exploration of potential futures, and identify indicators that would inform future vectoring decisions. The design model offered by the Stanford d.school serves as a good starting point by which to craft a process to design complex strategy. Strategic designers must first empathize, or develop a deep understanding of the problem and its systemic trends. In the context of commercial product design, the d.school defines empathy as “the centerpiece of a human-centered design process. The Empathize mode is the work you do to understand people, within the context of your design challenge.” Retaining the term empathy is essential and intentional, not only in concern to the foundational human element, but also to convey the need to thoroughly understand the system and the motivations of those involved. Unlike operational planning, empathizing runs continuously and simultaneously throughout the design process, as actions taken can change the surrounding context. Next, designers must seek to define the specific issue they intend to address, considering the variable and reactive nature of the complex environment. Designers must ideate repetitiously to develop multiple possible recommended actions before. Then, using controlled simulations such as war gaming or red teaming, designers can prototype, test, and adjust these concepts in controlled environments before prescribing real-world application. 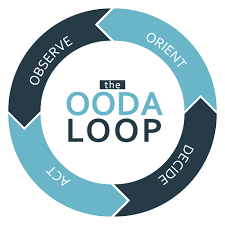 Another model worth considering is the Orient-Observe-Decide-Act, or OODA, loop developed by Colonel John Boyd to explain how the key to victory in an aerial dogfight is to make decisions faster than one’s opponent. This model offers a partial point of discussion relevant to the strategy design process in that it must be flexible, agile, and responsive to the surrounding context. However, both the OODA loop and the Stanford design model are limited in that they are intended for application towards a singular problem. By combining elements of both the concepts emerges a model that may be more adaptable to the continuous nature of strategic design. This resulting Cyclonic Design Model orients designers to revolve around a hub of continuous empathizing, allowing an unlimited number of design and experimentation processes to spin off. In this effort, designers must be cognizant of the inherent nature of the complex environment, in which any experiment may drive unpredictable system responses, in turn affecting the entire underlying system. This model is but one suggestion for how to approach strategic design, intended only as a starting point for discussion. Design by nature is fluid, adaptable, and contextual, and any strategic design process should remain likewise. As strategic designers seek to better understand the environment, they may very well determine another model or process would better serve their particular approach. Strategic design and the associated Cyclonic Design Model are neither static nor prescriptive, but rather a starting point for designers seeking to design complex non-linear strategies. As experiments change the system, they may also very well change the nature of the approach required to plan within the system. Therefore, strategic designers must be allowed not only the flexibility to design adaptable complex strategies, but also to simultaneously redesign the process by which the strategy itself is designed. As the Department of Defense wrestles with how to transform to meet the trans-regional and trans-domain challenges characteristic of the modern and future competition space, military planning doctrine offers an excellent starting point to begin this transformative effort. Simply admitting that existing operational planning methodology and doctrine are not applicable for complex strategic problem sets is a crucial first step. Once we break this paradigm, military strategists will be empowered to design new and better paradigms, yielding novel methods to more appropriately meet our nation’s strategic needs. Jeremiah R. Monk is a U.S. Air Force officer assigned to U.S. Special Operations Command as the Chief of Plans and Strategic Design. The views expressed in this article are those of the author and do not represent the official policy or position of U.S. Special Operations Command, the Department of the Air Force, the Department of Defense, or the U.S. Government. Office of the Secretary of Defense. National Defense Strategy. Washington, D.C., 2018. Joint Staff. Joint Publication 5-0, Joint Operational Planning. Washington, D.C., 2011. US Army. "Army Publishing Directorate." ADP 6-0 Mission Command. May 2012. https://usacac.army.mil/sites/default/files/misc/doctrine/CDG/cdg_resources/manuals/adp/adp6_0_new.pdf#page=8 (accessed September 27, 2018). Snowden, David J. 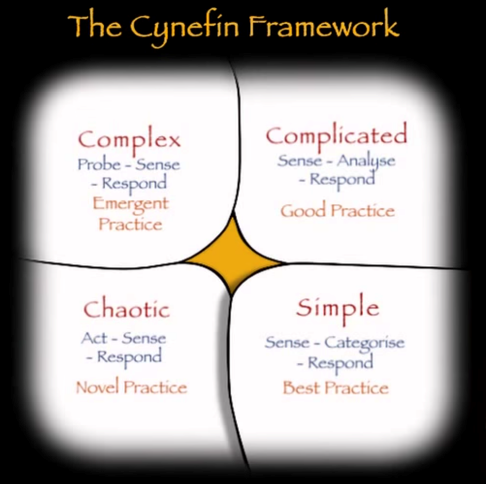 The Cynafin Framework. 11 July 2010. https://www.youtube.com/watch?v=N7oz366X0-8. Stanford University d.school. Stanford D.School. 2017. https://dschool.stanford.edu/. Image from www.Medium.com (accessed 09 13, 2018). Stanford University d.school. "An Introduction to Design Thinking Process Guide." dschool-old.stanford.edu. 2010. https://dschool-old.stanford.edu/sandbox/groups/designresources/wiki/36873/attachments/ 74b3d/ModeGuideBOOTCAMP2010L.pdf (accessed September 26, 2018). Kendrick, Scott. "Vice Versa: An Artistic Appraisal of Joint Doctrine's Expression of Campaigns, Major Operations, and Objectives." Modern War Institute at West Point. 11 July 2018. https://mwi.usma.edu/wp-content/uploads/2018/07/Vice-Versa.pdf (accessed September 26, 2018). Hammond, Grant T. The Mind of War: John Boyd and American Security. Washington and London:: Smithsonian Institution Press., 2001.